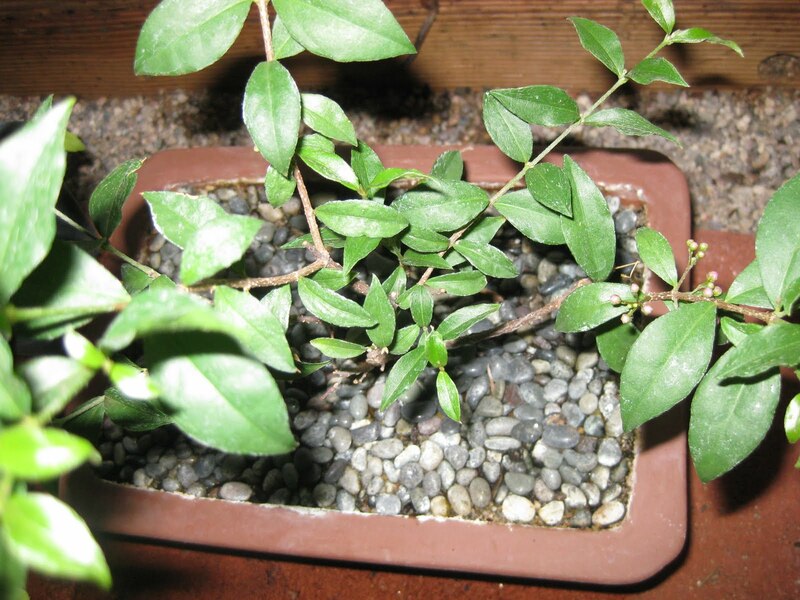 The Dwarf Barbados Cherry (Malphigia punicifolia) is a popular choice for use as a bonsai. This is mainly due to the plant's extremely small size. Aside from use as a Bonsai, the Barbados Cherry is great as an indoor/outdoor container plant. With the ability to withstand 25F temperatures, this plant is quite versatile and will do well in a greenhouse, indoors and outdoors (with mild winters). The light requirements of the Dwarf Cherry are moderate, allowing it to grow in partial shade or even indoors. It's demand for water is high and it shouldn't be allowed to dry out for extended periods of time. I recommend using a well draining soil and watering it often, especially when in bloom or fruiting. 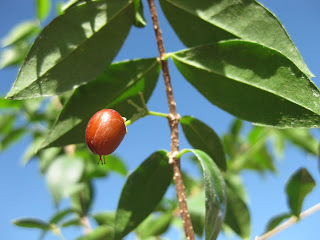 The Barbados Cherry (Malpighia emarginata) is a "grown up" version of the Dwarf Barbados Cherry. The plants look very similar in their leaf structures, flowers and fruits, the only difference is that the Barbados Cherry can reach heights of over 20ft while it's miniature counterpart remains at a mere 2-4 feet tall at maximum. The other difference is in popularity, the Barbados Cherry is commonly referred to as an Acerola and has remained very popular in its native tropics. On the other hand, the Dwarf Barbados Cherry is not as popular and remains in the shadows to most. However, the plant has gained significant support in bonsai communities as an attractive fruit bearing specimen. 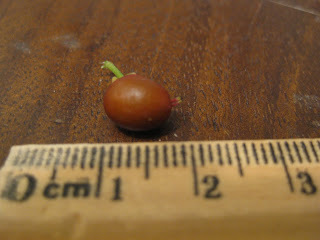 Cherries from the M. punicifolia are very small (just over 1cm long) and red when ripening. The taste is rumored to be sweet in some varieties, although I find the taste to be rather bland. If I could compare the taste to anything it would probably be a mild tomato. 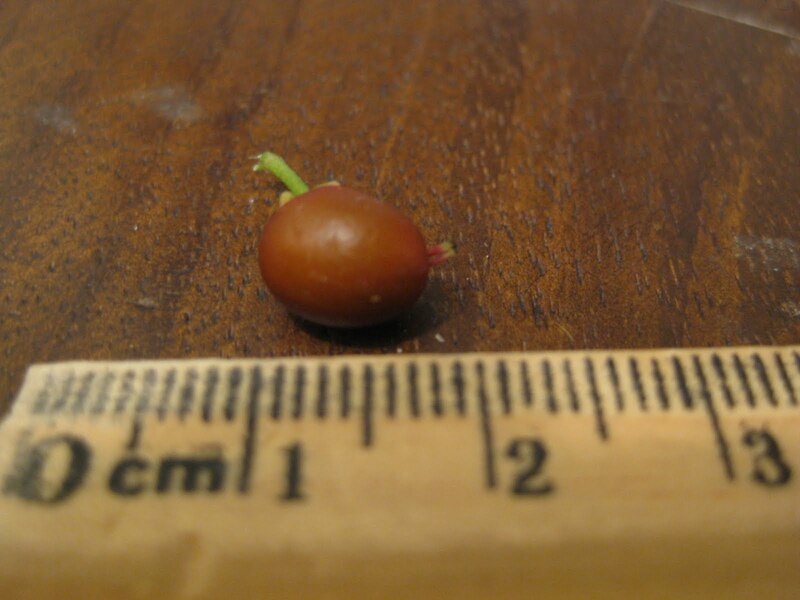 You will find a miniature seed inside of each cherry, but don't get too excited about sprouting it, germination is very difficult with this plant. There are blooming cycles that are activated by numerous factors such as day length, temperature, and water. I am unaware of any way to positively stimulate the plant to produce more cycles, but typically you can expect about 3-6 cycles a year in a mature plant. Disappointingly most flowers never turn into fruits, either due to difficulty in pollination or the plant's burden to produce a large quantity of fruit. You will notice that many of these plants have ten or more flower clusters on one branch so there is at least a lot of chances for fruits. 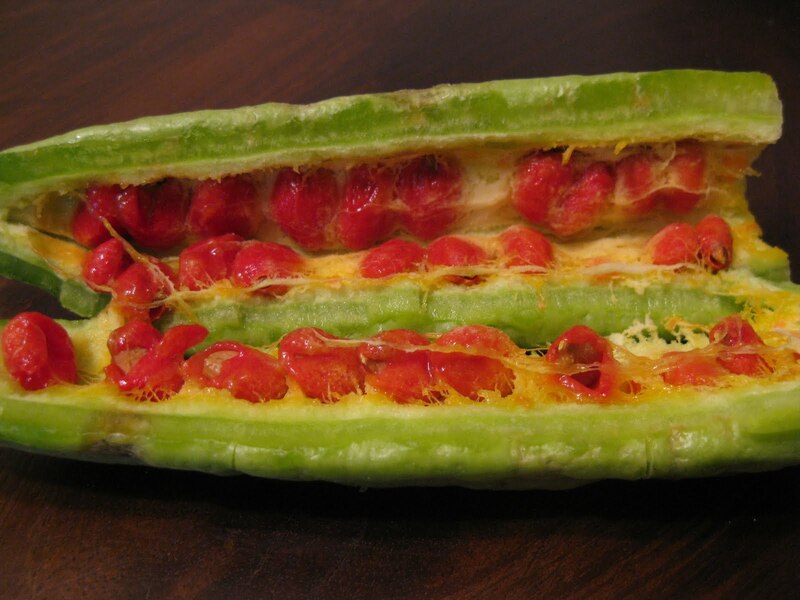 When pollination occurs the flower will lose all of its petals and then either shrivel up or develop a green fruit that will eventually mature and ripen red. There are many options available for the curious grower to get a start on growing their own M. punicifolia but the most common is propagation by cutting. Growing by seed may yield high genetic variability (if you can get the seeds to germinate), this may produce undesirable offspring. Propagation by cutting will as always, produce an exact clone of the parent. This can be done by selecting a branch that has some hardwood as well as a few leaves (the hardwood is a darker color and of older age than the softwood which is newer and usually greenish). Fungicide and root hormone should be applied to the end which was cut for the highest chance of success. There are a variety of methods which may be used to stimulate root growth of the cutting, these would be placing it in a plant propagator (typically an aeroponic system) or most simply by placing the cutting about an inch or two in a well draining soil. It may take 1-2 months before you can see roots grow but don't get too hopeful as most cuttings won't survive so do more than one. The Dwarf Barbados Cherry does excellent in almost any kind of bonsai container. I have mine planted in a shallow rectangular container made of clay, but I have seen them do well in narrow but deep containers as well. This plant is perfect for bonsai culture as it grows new leaves and shoots readily yet maintains solid mature looking stems. The most attractive aspect of this plant as a bonsai is its numerous and persistent flowers in addition to its fruit. Personally I have found aphids to be the most devastating, they primarily attack the young flower buds and leaves. I take care of them by spraying a safe insecticidal soap twice a week until they are gone. I have heard that nematodes and pathogens are other common problems. 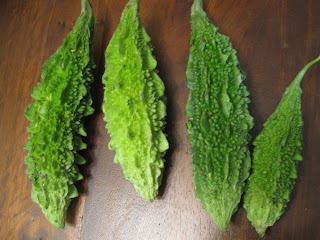 Momordica charantia (aka bitter melon or bitter gourd) is a popular vegetable in many Asian countries and has an adamant place in Asian cuisine. Bitter melon's popularity doesn't stop at being a staple food crop, it's also used as a medicinal treatment for a wide array of illnesses, and it often consumed as a tea. 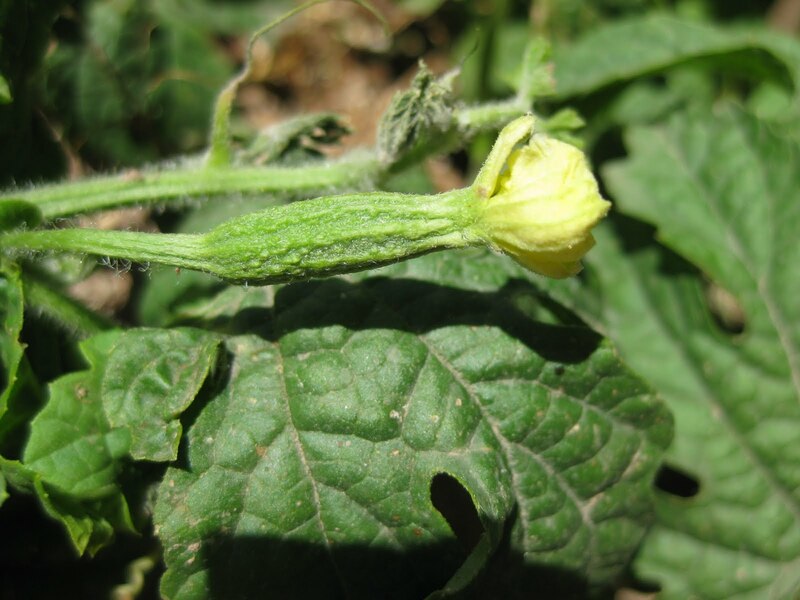 It's a member of the Cucurbitaceae family along with cucumbers, and the resemblance is clear. The problem most people have with bitter melons is their bitterness, it is definitely an acquired taste. For culinary chefs the bitterness can be used as a compliment in their dishes, making the bitter melon very useful in cooking. 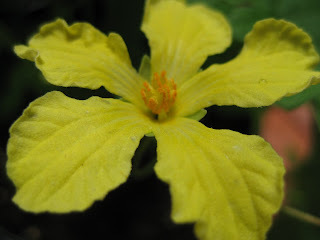 Growing this plant out of it's desired sub-tropical/tropical climate is very easy, but only as an annual. When growing bitter melon think of it as if you were growing a cucumber, start after the last frost of winter and expect them to grow until it gets cold again in fall. It prefers high humidity but they can still be grown in low humidity. 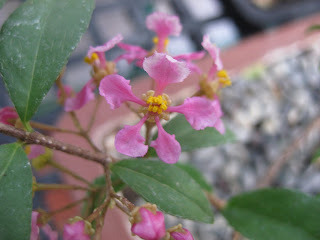 You will find that this plant is a fast grower, but is even faster at blooming. I have noticed flowers on bittermelon vines that are only 6 inches long! As far as aesthetics go, it's not a terribly pretty plant and it has a very bitter smell. Just touching the leaves of this plant will make your hands smell with a spicy bitterness. There are many different types of bitter melons with different textures, tastes, and sizes. 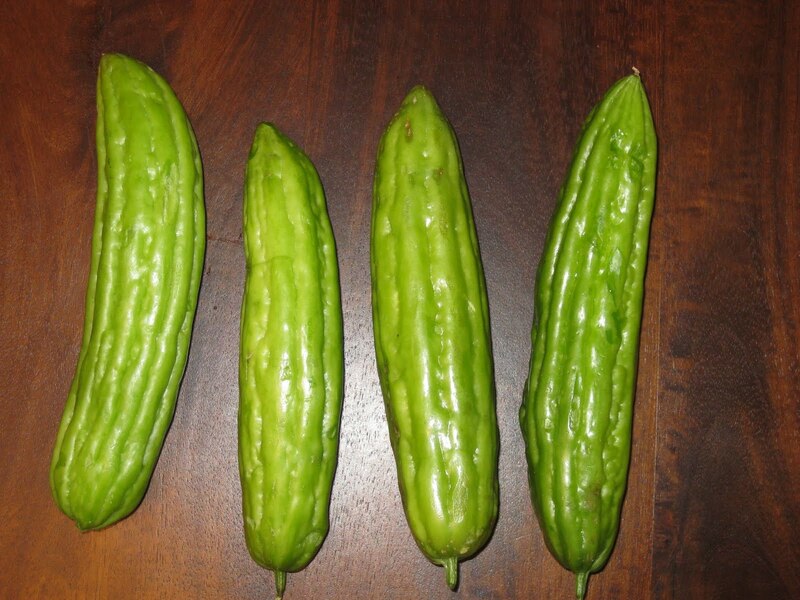 The Indian bitter melon (below) is generally smaller and very bumpy. 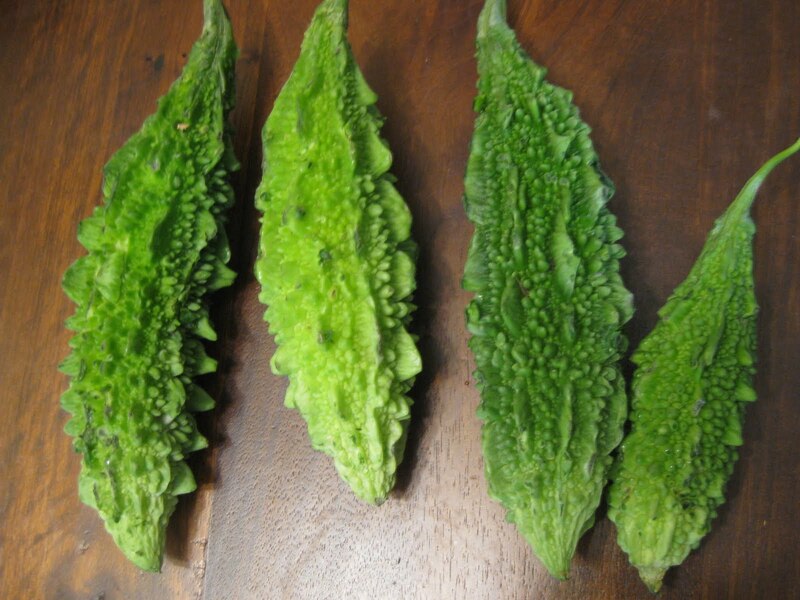 Chinese bitter melons (Top of page) are long and smooth and are a lighter shade of green. 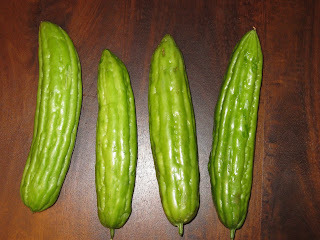 There are bitter melon hybrids that are white and some that are extremely long, some even have different leaf structures. Collect hard seeds from the bitter melon, the soft white seeds aren't viable. You will notice red flesh surrounding each seed, if the flesh is white that means the seed probably isn't viable. Take the seed out of the pocket of flesh before planting. Expect about 15-30 seeds per bittermelon depending on their size and variety. You can either let them dry out or plant them immediately. Plant them about ¼ inch in a well draining soil and water daily. Germination period is around 7-14 days and time until harvest can be sooner than 60 days! I have noticed that these vines are mildly drought tolerant and do well even in excessively hot temperatures. 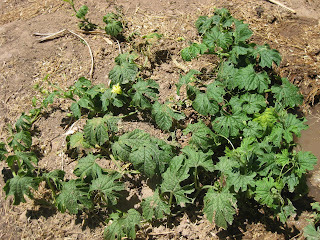 Frost is deadly to these plants thus making it an annual, although in tropical locations it can survive as a perennial. 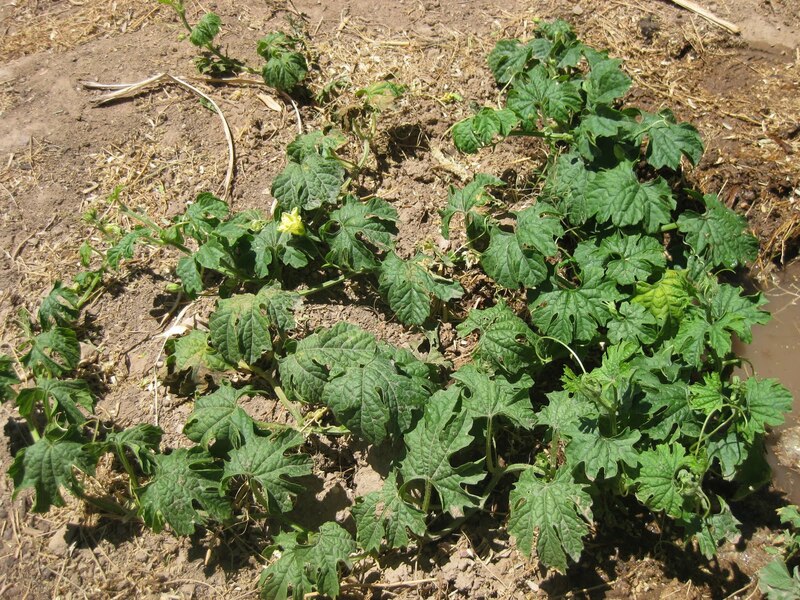 Bitter melon vines can tolerate slightly acidic and slightly alkaline soils making them fairly versatile. A trellis should be provided if you want to keep this plant from spreading and taking over other plants. This way the bitter melon vine can attach its tendrils to the trellis as opposed to neighboring plants. Give this plant a lot of space, it grows fast and is ready to conquer a greenhouse or garden. The bitter melon plant has both female and male flowers which means that a pollinator must carry the pollen from the male flower to the female to complete fertilization. The most common pollinators are bees and other flying insects, although if you don't have any natural pollinators or are growing in a greenhouse it is easiest to hand pollinate them. You can do this by using a small paintbrush and collecting pollen from a male flower and applying it to the female flowers. Typically the vines have far more male flowers than female flowers which means that most flowers will not turn into fruits. You can tell the difference between male and female flowers by the flower stem. That of the male will be long and thin while the female's flower stem will have a small unfertilized bitter melon attached to it. A pollinated female flower can be seen in the picture below. There are a wide variety of techniques when cooking bitter melon but most common are using them in stirfries and soups. Many people like to fry or pickle the bitter melons to add flavor and reduce bitterness. If used in a stir fry or soup you should cut the bitter melon in slices or in sections, but make sure no mature seeds are included. If you are using immature bitter melons you will notice that the seeds are small and soft making them edible. Bitter melons are commonly deep fried and often breaded too, making a nice snack food. The bitter melon itself is crispy and very watery with a spongy flesh on the inside with the seeds. Bitter melon products are widely available and quite popular in many countries. You can find bitter melon as a flavoring in candies, bitter melon tea which claims to carry medicinal benefits, as well as bitter melon soda! This is a box of Gohyah tea that is made with the bittermelon/bittergourd. Gohyah tea is dried slices or pieces of the bitter melon and it should be brewed just like any other herbal tea. 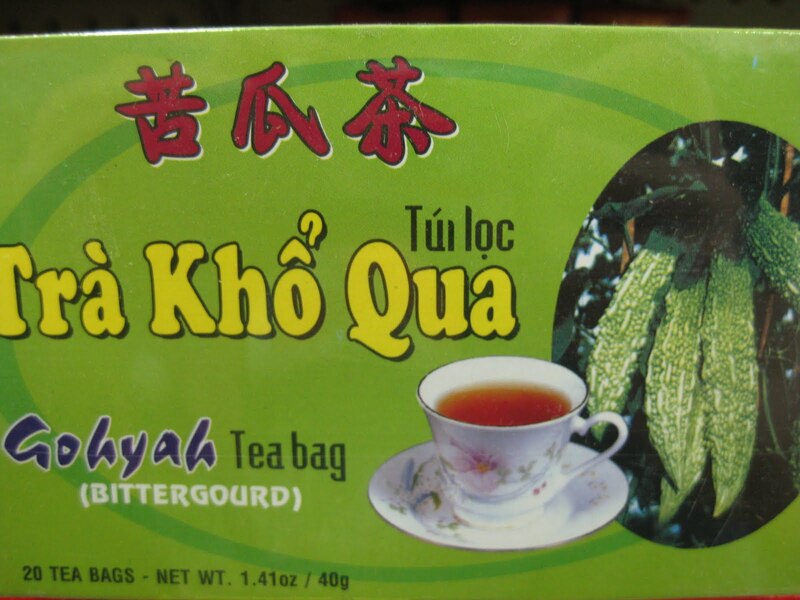 The Vietnamese name for Gohyah tea is "Tra Kho Qua" while the Chinese name is "KuDing".